Your hemoglobin A1c levels measure your average blood sugar over the last 2 to 3 months. Hemoglobin A1c levels give you an idea of how your diabetes control is doing overall. You need to check your hemoglobin A1c level at least twice a year, and more frequently if your blood sugar is poorly controlled. Talk with your doctor about your hemoglobin A1c goal, but most will want a level of 7% or less. What Do My Hemoglobin A1c Levels Mean? Your hemoglobin A1c level gives you an idea of how well your blood sugar has been controlled over the last several months. This test lets you know if your diabetes plan is working or not. Hemoglobin A1c levels are a reliable method of assessing how well your blood sugar has been controlled. Elevated levels over long periods of time are associated with the long-term complications of diabetes. After reviewing your hemoglobin A1c levels, your doctor will recommend changes in your treatment plan or tell you that your diabetes plan seem to be going well. How Does the Hemoglobin A1c Test Work? When you have excess blood sugar in your bloodstream it binds with hemoglobin or glycates. The more excess blood sugar the more hemoglobin gets glycated. As a result, the higher your hemoglobin A1c the more poorly controlled your diabetes. Because the average hemoglobin cell lives for 120 days, your hemoglobin A1c level can reflect your blood glucose control over that time. In a person without diabetes, the hemoglobin A1c level is about 5%. According to new standards, diabetes can be diagnosed when the hemoglobin A1c level reaches 6.5%. How Often Should I Have My Hemoglobin A1c Level Checked? Your doctor will likely check your hemoglobin A1c level either as a screening test or when you are first diagnosed with diabetes. If your diabetes is under good control, you should have a hemoglobin A1c level checked at least every six months. If your diabetes plan is not achieving optimal control, your doctor may check your hemoglobin A1c level more often. Are There Any Limitations For Hemoglobin A1c Levels? Some patients have other medical conditions that limit the use of hemoglobin A1c levels in monitoring their diabetes. The hemoglobin A1c level is unreliable in patients with sickle cell disease or sickle cell trait. In these patients hemoglobin is slightly different and the tests to measure glycated hemoglobin overestimate the actual blood glucose over the last three months. 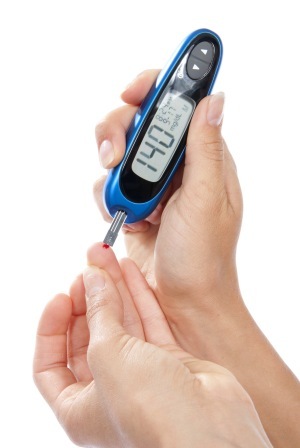 Alternatively the fructosamine test can be use to measure diabetic control. Can I convert hemoglobin A1c levels to an average glucose? Hemoglobin A1c levels can be converted to an estimated average glucose or eAG result. The eAG is more familiar to patients who are testing regularly at home. For example, a hemoglobin A1c level of 10% converts to an eAG of 240 mg/dL while a hemoglobin A-1 C level of 6% converts to an eAG of 126 mg/dL. The chart below converts hemoglobin A1c levels to eAG. Nathan MD, David M; Kuenen MD, Judith; Borg MD, Rikke; Zheng PHD, Hui; Schoenfeld PHD, David; Heine MD, Robert J for the A1c-Derived Average Glucose (ADAG) Study Group. “Translating the A1c Assay Into Estimated Average Glucose Values.” Diabetes Care Aug 2008 31(8):1473-1478.